Their mission is to advance education in the field of cardiac, thoracic and vascular interventions; and promote research into cardiovascular and thoracic physiology, pathology and therapy, with the aim to correlate and disseminate the results for the public benefit. In addition to sharing the Heart Valve Voice message with the delegates, we also had an opportunity to walk around the Emerging Technology area where we could see some of the new technology used to help clinicians improve patient outcomes as well as patient experiences. Wil was able to network with a number of leading clinicians and reconnect with surgeons like Kulvinder Lall, Consultant Cardiothoracic Surgeon, Barts Hospital and Prakash Nanjaiah Prakash Nanjaiah, Specialist Registrar, Cardiothoracic Surgery at University Hospital Wales, and Youhana Aprim, Consultant Cardiac Surgeon at Morriston Hospital, Wales and our Chairman Chris Young, Consultant Cardiothoracic Surgeon, Guy’s and St Thomas’ Hospital. On the final day of the conference our chairman addressed delegates with a presentation on the importance of patent Engagement. 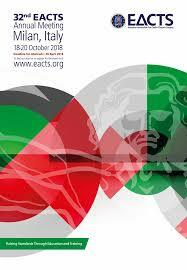 “As Chairman of Heart Valve Voice I was pleased to presenting at EACTS on patient advocacy and the increasing role of patient choice in our decision making. I’m also very pleased to see Pat at conference and I’m thrilled that she continues to demonstrate the quality of life you can have after surgery” said Chris.